jBilling is architected to solve very complex billing scenarios in a manner that gives you control. The platform’s deep configurability, plug-in architecture, API and scalable design make it easy to adapt to your specific needs. You’ll always be able to innovate around new business models and billing metrics—without the long and expensive coding projects you’d need with a rigid billing system. Benefit from the industry’s most configurable billing platform. Built directly into jBilling’s intuitive interface are practically endless options to configure accounts, build a product catalogue, manage orders and payments and design invoices. Add custom fields to your accounts or product catalogue, use account types to group customers—jBilling’s flexible data model let’s you set up billing for your unique business needs. As well, complicated subscriptions and pay-per-use scenarios are most often handled without custom coding. This means you can easily adapt your billing to how you want to do business, bringing agility to your company. Customize the smart way, stay agile and preserve your upgrade path. jBilling recognizes that no billing system will cover every one of your current business rules and that your future needs will inevitably require some custom logic too. With most systems, though, customizations come at the high cost of developing and maintaining a custom solution. They can also inhibit you from further extending your billing system. jBilling takes a different approach. Our plug-in architecture lets you have the unique features you need through isolated custom code—no modifying jBilling core. You can further modify your plug-ins or develop new ones rapidly to take advantage of new business opportunities. jBilling comes equipped out-of-the box with a set of powerful system plug-ins. Need a custom plug-in? You have the option of jBilling developing for you, or you can employ your team’s expertise. Set up jBilling to communicate fluidly with custom apps and enterprise systems. jBilling’s robust API addresses 100% of the platform’s functionality. In fact, the jBilling user interface uses the API to interact with the jBilling server so you’re assured an API that keeps pace with product enhancements. You can also fully integrate jBilling with other enterprise systems such as CRM, ERP, Accounting, Tax etc. to streamline business processes, cut down on duplicate effort and make sure your data is consistent across systems. jBilling Workflow takes our API one step further. You can use it to centralize and orchestrate your integrations from jBilling’s interface. Your team will gain visibility into steps taken across systems for important business processes, and you’ll be able to automate workflows to improve business efficiencies. Remain in control of your billing, always. Billing is mission critical. You need to understand it. You need to trust it. Unlike most billing systems, jBilling is not a black box. 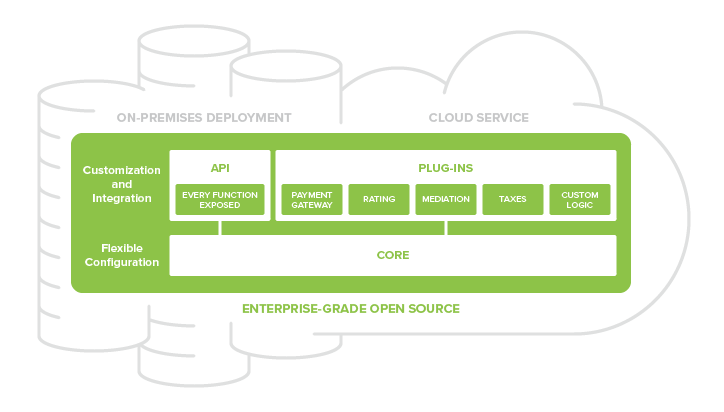 Our open source technology gives you complete visibility into source code so you understand exactly how your billing is operating and how you’re interfacing with your other enterprise platforms. Choose a billing platform that allows for scalability as your business grows. With scalability being a key design objective from day one, we developed a cloud architecture that scales horizontally so you can start small and grow as big as your business takes you. Our mediation, collections and billing process engines work in parallel to process multitudes of transactions in real-time, so you never have to worry about outgrowing your billing system.